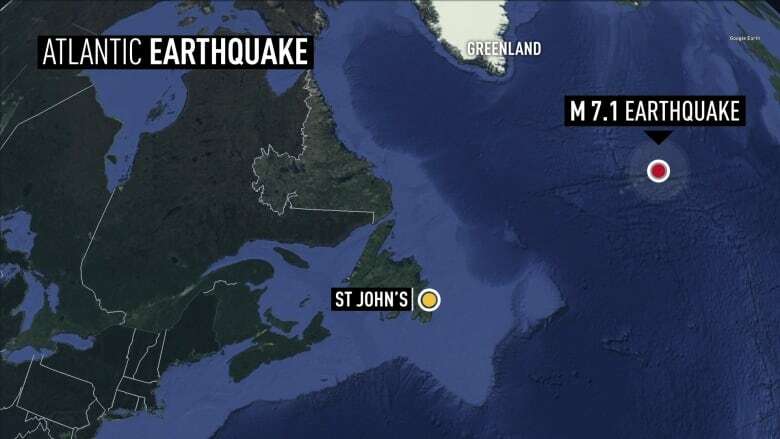 A 7.1-magnitude earthquake hit the mid North Atlantic on Friday — the largest one in 48 years. It happened along the Mid-Atlantic Ridge around 3:30 p.m. NT. The quake was closer to Greenland and Ireland than Newfoundland. It happened about 1,400 kilometres from Iceland, 1,500 kilometres from Ireland, and about 1,700 kilometres from the island. There have been five recorded earthquakes in that area in the last century. Prior to Friday's quake, the largest on record was a 7.0-magnitude quake in 1967. None of the earthquakes in that area are known to have caused any damage.